Most nights, I couldn't wait to fire up my PS4 and get lost in Bloodborne's world of rot and misery. I'd play well past my intended bedtime, stifling yawns while I carved up ghouls in my pyjamas. However, there were also evenings where I was far less eager, nights where I made little to no progress and questioned whether Bloodborne was worth losing an hour of sleep. On the good nights, I struggled to put Bloodborne down. There was always one more area to explore or another boss that I wanted to have a stab at. Across fifty hours, my blood splattered hunter and I covered every last inch of Yharnam, successfully taking down every boss, some more successfully than others, and mingling with the locals. I enjoyed the shift in combat from Dark and Demon Souls’ more deliberate and defensive style, to a speedier and more aggressive approach. The ability to regain health by quickly attacking after taking damage rewards aggression and (calculated) risk taking, though spamming buttons will get you nowhere. 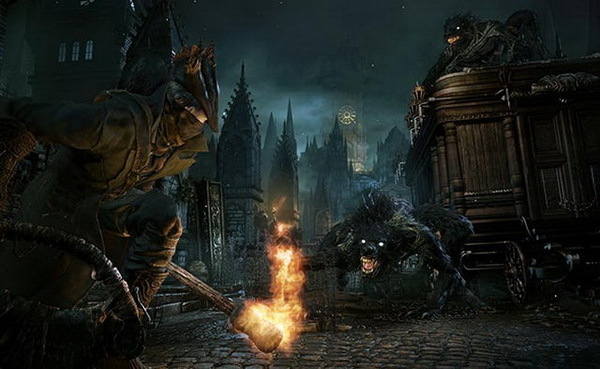 The Hunter is agile enough to dance around large groups of enemies, and the side-arm parry is a skill worth mastering. However, I did eventually abandon my gun in favour of two-handing Ludwig’s Holy Blade, essentially creating a much faster version of my preferred Dark Souls' build. A drastically reduced number of weapon and armour variants make inventory management far less time consuming, and I spent most of the game happily swinging the same weapons and rocking the same threads. The narrative gives very little away but I never once lost interest. You are fed just enough information for the story to make sense, but the details are left up to the player’s imagination, and mine ran riot. On the good nights. On the bad nights, I wanted to throw Bloodborne in the bin, and then set fire to said bin. When things weren’t going my way, I was far less willing to overlook its faults. I’d roll my eyes at yet another four-legged zombie boss, and wonder what happened to the varied design that made Dark Souls so memorable. I finished BB pre-patch, and there were evenings where I swear I spent more time staring at load screens than I did actually playing the game. I brought down every boss on my lonesome, though there were a couple of instances where I sought help and tried to summon a co-op partner. Unfortunately, no one ever came and I was left to struggle alone, when all I wanted to do was move on. Each failed attempt saw me burn through my collection of Blood Vials (curatives) and I'd be forced to go and collect more before attempting the fight again. This meant returning to the opening stages of the game and steamrolling the locals in the hope that they would drop precious vials. This was fun at first but quickly became tiresome, especially towards the end of the game when boss encounters grew more challenging and vials became a far rarer drop, forcing me back to the Central Yharnam circuit at least once per evening. This killed Bloodborne’s flow and severely sapped my enthusiasm. There were good nights and there were bad nights. Some sessions were awful, but come the next day all had been forgiven. Even when I hated Bloodborne, I still loved it, and that's all that matters. Bloodborne is the PS4's best exclusive - Resogun held that title for far too long - and an early contender for GOTY.